I woke up this morning fairly early, even though I would have liked to sleep a lot longer, so that I could join departing sxswi folk for breakfast at the Hampton. We hung out from 9am until about 11am, saying goodbye as folks had to depart to the airport. A group then moved over to the Halcyon coffeehouse for real coffee and I joined them after Lauren and I got the room payment sorted out (Thank you, Omnicom!). Off Lauren and Dave went to the airport. When I returned from Halcyon, Mary at SXSW Housing had come through and the Hampton Inn had a regular king room for me to move myself to for the next two nights. Wahoo! After moving rooms, I walked over to the Whole Foods mothership to get more fresh veggie/salad stuff, face stuff, and a whole lotta dark chocolate. Upon returning to the hotel, I took a bar of dark chocolate with cherries and a bar of dark chocolate with raspberries over to Mary at the SXSW Housing desk to say thanks. Veerle, Geert and I tossed around the idea of going for a walk around Town Lake, but I bowed out, as I was absolutely exhausted. I had no more than settled in for a nap, when Alex called to find out why I wasn’t at the Volcom afternoon party yet. Obligation to say hi to the LA folk reigned, so up I got and off to the Jackalope I went to make it in time for the Riverboat Gamblers. Riverboat Gamblers = excellent as always. Crowd = club overly full and the rock/punk crowd more than a bit shopworn compared to the shiny faced geeks. I ran into my least favorite LA person within minutes, but Lisa Johnson came to the rescue. Right as I was about to leave, I saw Hector Martinez and finally found Alex, so I stayed about 20 more minutes before my voice completely gave out and I was tuckered. I really did go back to the hotel for a nap. At 7pm, I met up with Veerle and Geert for a lovely dinner around the corner at Flemings. I must say that one of the best parts of this SXSWi was the arrival of the Flemish/Belgian and Dutch crowd. Veerle, Geert, Kenneth, and Faruk were truly delightful and tons of fun. After dinner, the first early evening in over a week, saw me in bed with the lights off at 10:30pm. 5:00pm – no panels, just hanging out in the hallway talking to folk. Last day of Interactive. 6:30pm – Wine and Cheese Party II – Only two bottles of wine and about 20 folk, so I trotted over to my fave restaurant across the street from the hotel and bought a bottle of wine. Jon Hicks brought cheese and the welcome basket/bag he had received from Glenda. Glenda brought James Craig and Keith from another party. Around 8pm, we broke and went over to the the fave restaurant for dinner before hitting the Media Temple Closing Party. The closing party was held at The Foundation, which is a great new venue on the west side of downtown. Great lighting, seating, and guess what… an open bar! I had a good long chat with Jill Carson and we cooked up me visiting her and Ryan in Bath sometime soon. Just as I started to hit the wall, James C. and Keith were leaving the party, so I walked over to the Red Bull Play Room with them. We couldn’t get it until Eris showed up and used Dodgeball to ping someone inside to give us a key and a wristband. Except it did not cover all of us outside, given how tired I was, I opted out. James and Keith also decided to depart, leaving Eris & Faruk and others to go in. I hope they had fun, I was excited to go back to the hotel and go to sleep. Noon to 2pm was the Bloggies and I gave away certificates for the 3rd year. George Kelly transcribed the proceedings for the IRC channel. Nikolai sang a song. Betsy Devine came up and chatted after. Her husband won the Nobel Peace Prize in Physics last year and she told George and I about the experience of the Award Dinner in Sweden with the Crown Prince. Betsey is a delight. Tonight’s round of parties saw a group of us going to Moonshine for dinner. I sat with Glenda the Good and Jon Hicks and we discussed life, the world and faith, much to Craig’s chagrin. After dinner, Glenda, Lauren, and Andy Budd jumped into a cab to go the end of the Bowling event and the rest of us walked up to the Velvet Spade for the Adaptive Path / Odeo Party. Ok, folks, the Money is Back. That is all I’m saying. Hello, open bars? That has not been seen since 2001! Two lemondrops later, I was bouncing around the venue chatting, hanging out, watching the Pork Chop Express band (singer with an electric ukelele) with Chris Mills, and watching the drunken dancing. Bowling folk showed up, more festivities were had. 5:00 pm – Lauren and I meet up in the hallway and decide to not go to any of the 5pm panels, instead we go to the hotel to drop things off, freshen up and go over to the Flickr / Upcoming.org/ del.icio.us / Yahoo! party at the Iron Cactus. This party was one of my favorites for the who week. Good food, good drinks, good conversations. Finally had time to catch up with Heather Heskith and somewhat with Steve C. Also briefly caught up with Heather Champ about interviewing her for my thesis. The funniest part of the evening is when Steve had Heather and I bookend Jeffery Veen to keep him in one place (Heather and I are about 5 feet tall, Jeff is about 6’4″ or so). I would have liked a photo of that. Austin’s I Love You But I Have Chosen Darkness played the party. Thanks to Yahoo! for the party. As Lauren and I were leaving we ran into MJ, Dave Shea, and Nicole Lee on their way to the Fray event at the Red Eye Fly. All of us added a kiss to Dave’s cheeks and of course took pics of his lipstick attack. About a half hour into Fray, I hit the jet lag tired wall and went back to the hotel. I ran into Christopher and he was on his way to a late supper at P.F. Chang’s. I joined him. I heart P.F. Chang’s for the fresh food, veggies and brown rice. It made all the difference. Lunch at Paradise on 6th St. with Jessica Spengler, LEI, J Cornelius, et al. The Nachos turned out to be made with “corn” chips made with wheat flour, tummy system very sick for over 24 hours. 6:30pm – Wine and Cheese party (from whole foods) at my room with Veerle Pieters, Geert, Kenneth H, Jon Hicks, Alun, Steve Grant, Shaun Inman, Lesile Jensen, Lauren Isaacson, and Geoffrey g. Good conversation and laughs. 8:30pm – take shuttle to the Frog party. Not at the office, but at some open warehouse over east of the I-35. Very hot. Nice chat with Michael Nolan. Left after 3/4 an hour as it was way too hot. Apparently, the second band was good and folks in costume showed up after we left. Dinner with LEI at P.F. Chang’s for veggies and brown rice. 11pm – South by Northwest party at the Iron Cactus thrown by Blue Flame and Nick Finck. Very very crowded but good folk. MJ did the round of “branding” (kissing). Nice chat with Gareth Knight of London and with Jessica Spengler. Then jet lag caught up with me and my bubbles and chirp factory stopped and I stopped talking so it was time to go and go to sleep. Posted March 18th, 2006 by Ms. Jen & filed under sxsw. 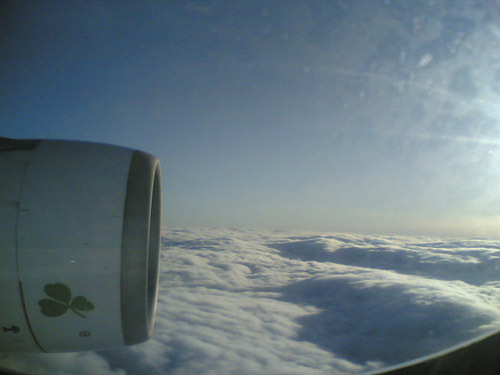 Photo by Ms. Jen’s Nokia 7610 of the plane on the final descent into Dublin this morning. …my body is not sure what day it is or what time it is. I miss Austin. On Thursday night, I joined James Craig and his friend Courtney at the Town Lake amphitheatre for Blackalicious and Spoon, it was delightfully warm, the skyline of Austin across the lake, great music, good company, and stars in the sky. Can I please go back to the Town Lake shore, sit on the grass, and look at the stars? While SXSW Interactive 2003 was the best year for panels and technolody inspiration (that was the year that got me to start this blog), this year was the best for people and conversations. I have all of my transcripts ready to go, I am still working on the images for my daily photo essays. When I get them all up, most likely tomorrow, I will make a post with all the links to the various bits. On a fun note, or not so fun note, I walked out of the Dublin Airport this morning after getting off the red eye from Chicago, wearing my SXSW t-shirt and a pair of capris to be greeted by a wind straight off the plains of Siberia. I screeched, ran back inside, pulled my jacked out of my big bag, and wondered what I had been thinking. After donning my jacket, I got into a cab, and the cab driver asked me if I had broken any hearts in Texas (what? my brain was not computing) and then he went on to inform me that he was on Viagra. I was very very very thankful to get out of that cab and arrive at my warm apartment. Posted March 17th, 2006 by Ms. Jen & filed under sxsw. 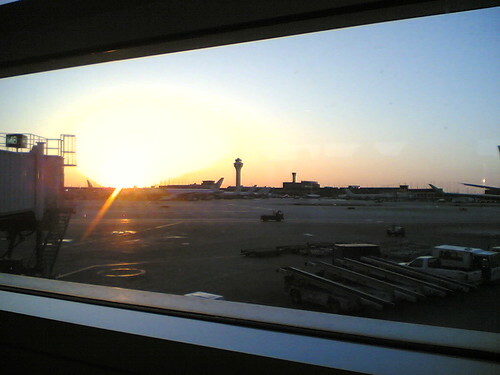 Fri 03.17.06 – Goodbye SXSW. Goodbye Austin. Fare thee well to all of my friends. Big hugs to all of you. Above photo of Chicago whilst waiting to board the plane to Dublin. Posted March 16th, 2006 by Ms. Jen & filed under sxsw. 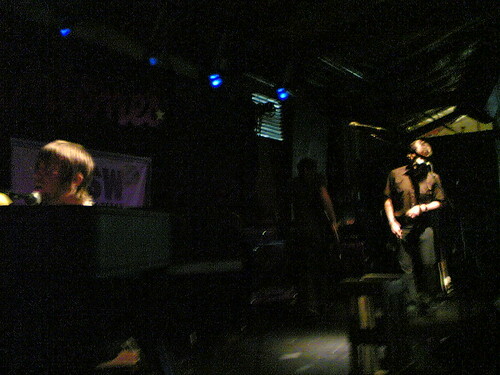 Thur 03.16.06 – SXSW 2006 – Former web design student, Matt Maust’s band.